Place cookies on a parchment-lined baking sheet. Bake for 6-9 minutes, or just until the cookies are set in the center and the bottoms turn a very light golden brown. Remove cookies and cool completely. Melt chocolate chips in a zip-top bag, snip a small corner from the bag, and pipe the melted chocolate in a drizzle atop each cookie. Sprinkle with sea salt flakes, if desired. Allow chocolate to cool and harden before serving. The easiest cookies ever? Maybe. The tastiest cookies ever? Definitely. A new holiday cookie favorite? You better believe it. You know and I know that we secretly turn somersaults when we come across a quick-and-easy holiday recipe. The season gets so insane, it's an absolute relief to come across a proper shortcut. And this cookie, it's a proper shortcut. Supremely simple. Yay hoo. Threeeee ingredients to make these cookies. That's it! Pop Betty Crocker sugar cookie mix, cream cheese, and chopped pecans in a bowl. Use a fork to mix them together. A soft dough will form. You may have to use your hands to bring it all together. Break that dough into two pieces and roll each piece into a log. Slice with a sharp knife and rework the dough as needed to create nice, rounded cookies. Place on a baking sheet and bake until light golden brown. 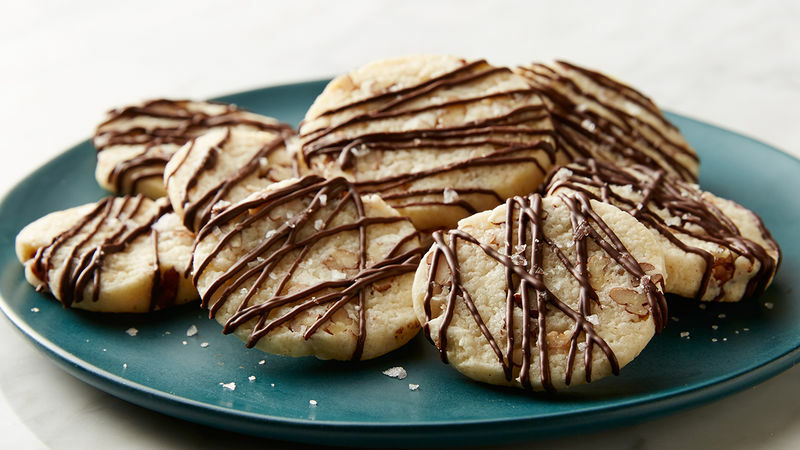 You can stop here if you want, but two more basic ingredients and one more step, and you'll have chocolate-drizzled, sea-salt sprinkled cookies happening in your kitchen in five minutes flat. You'll have enough time to dip these babies in a glass of milk and wait for Santa to stop by. Yours to enjoy – or to share!